Disney doesn't offer "Last Minute Deals" because they have to staff hotels, restaurants, theme parks, and transportation and last minute surges just create problems. Disney gives the best rates to the people who book their Disney World vacation packages early. Not only that, Disney Dining Reservations can be booked up to 180 Days Prior to Arrival. Popular locations like Cinderella's Royal Table, O'hana, and Chef Mickey fill early so booking early gives you the best shot at getting your first choice in restaurant and dining time. Another advantage to booking early is that you can schedule FASTPASS+ reservations up to 60 days prior to arrival if you have a Walt Disney World Resort vacation package for the official Disney World hotels and a handful of "Good Neighbor" hotels. You can book your FastPass+ reservations 30 days prior to arrival if you’re staying off property but purchase your tickets in advance. We are convinced that everyone can benefit with good theme park touring plans (itinerary). During busy times, a good plan will absolutely keep you ahead of the crowds and out of the long lines. During less crowded times, a good plan factors in shorter park hours and fewer performance times. A good touring plan also helps you pick the FastPass+ options and times that offer the biggest advantages in terms of avoiding long lines. But the most important benefit of a good plan is that everyone gets to ride and see the things that they are looking forward to because everyone's priorities are included in a plan that tours the parks efficiently and effectively. Tip 3: Arrive at the Disney World at least 30 minutes prior to park opening! The parks are at their least crowded in the first hour or two of the day. It is so much better to arrive early and take a mid-day break than to arrive late and get in line behind everyone else. During summer months, it is great if you can get to the parks at least 30 minutes prior to park opening - giving you time to get through security and get near the entrance. Arrive even earlier if you do not have FastPasses for Seven Dwarfs Mine Train in Magic Kingdom, Avatar Flight of Passage in Disney’s Animal Kingdom or Slinky Dog Dash in Disney’s Hollywood Studios. Click here to learn more. I don't want you in a restaurant when the crowds are low, just to leave and get in line when the crowds are getting long and the day is getting hot. Get a late (brunch) seating or, better yet, book character lunches or dinners instead - you'll enjoy the lower morning crowds in the parks and then sit down to eat when you're ready for a break. Remember that character breakfasts are now confirmed with a credit card and subject to a $10 per person "no show" penalty giving you another big reason to avoid early morning reservations. Tip 5: Be Smart about Extra Magic Hours! Extra Magic Hour(s) are times when a Disney World theme park opens an hour early or stays open two extra hours for anyone who stays at one of the official Disney World Resort hotels. Disney has over 30,000 hotel rooms which means that during Extra Magic Hours, too many people are being pointed in the same direction at the same time. The Extra Magic Hour park will be the most crowded park of the day so go to a less crowded park and enjoy more attractions without having to arrive painfully early or staying so late that you'll be too exhausted to get to the next day's park before park opening. Important! This information is especially important for anyone not staying at a Disney World hotel! You really don't want to arrive at a Disney theme park at park opening just to find that Disney hotel guests have been forming lines for a whole hour so it is really important that you know which park has Extra Magic Hours on each day of your visit so that you can visit that park another time. Exception to the rule: There is one exception to this recommendation and it only applies if you have Park Hopper Tickets - some young adults and teens really love being at the Disney parks until the wee hours of the morning. If this sounds like you, enjoy the evening extra magic hours but know that you'll be crowded and know that you'll be tired the next day. Do you have the water park option? Then go to a water park after your late night at Disney World - a late arrival at a water park won't be a problem, just plan on riding the most popular attractions closer to the end of the day when the crowds are thinning. Fantasmic! at Disney's Hollywood Studios will have two (2) performances on certain nights. If you can stay up later, the second performance is always a lot less crowded than the first one. Check your Disney's Hollywood Studios Times Guide to be sure that going to the later performance doesn't mean missing the Star Wars themed fireworks though. Tip 7: Save Time & Money on Snacks and Water with Garden Grocer's Delivery Service. You can pay $3.50 for a bottle of soda or water in the Disney theme parks or you can get 35 bottles of spring water for $10.99 through Garden Grocer, a grocery delivery service that will bring food and beverage items right to your resort. Our family of six saves a lot of money by doing a quick breakfast in our room, rather than buying it at the resort food court. Disney will allow you to bring snack items into the park so you can save money that way too, just remember that hard sided coolers, glass containers and alcohol are prohibited. There is a delivery fee for this service but it less than you would spend on a taxi and you won't waste valuable vacation time wandering around an unfamiliar store. You can schedule delivery for your arrival day and Disney will store your food until you arrive; they'll even refrigerate cold items for you. Here are a few important tips: 1) Remember that most of the Disney resort hotel rooms have mini-refrigerators so a full gallon of milk is going to take a lot of your refrigerator space, plan cold items carefully. 2) Florida water has a distinct taste (my daughter calls it “alligator armpit water”) so you may want to order a one-gallon container of filtered water if you plan to use the coffee maker in the room. Warning: The Disney value resort rooms do not have coffee makers. 3) They do have a limited number of deliveries available for each hour and date so ordering early is a good idea. Click here to learn more about Garden Grocer. 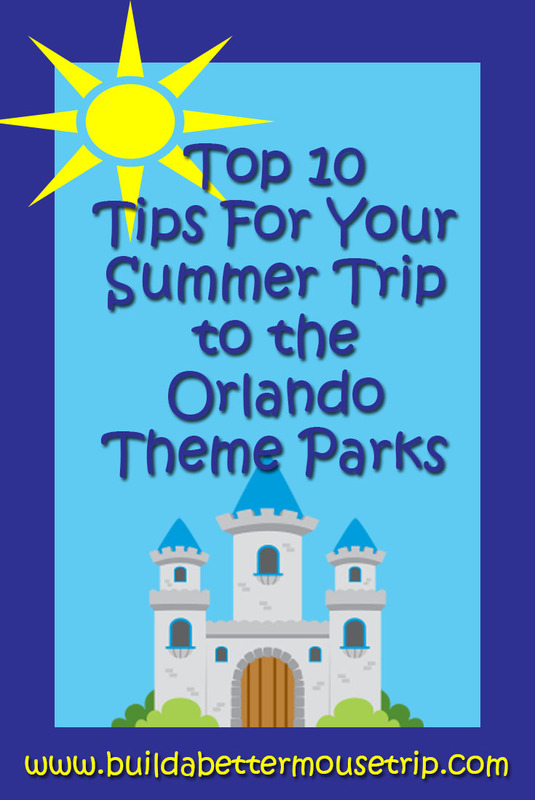 Tip 8: Do These Attractions As Soon As The Park Opens! Disney's Animal Kingdom: If you have a FastPass+ reservation for Avatar Flight of Passage, go to Expedition Everest as soon as the park opens. If you aren't into roller coasters, go to the Africa area and ride Kilimanjaro Safari and see the first Festival of the Lion King of the day. If you don’t have a FastPass for Avatar Flight of Passage, you really need to arrive early - click here for more information. Disney's Hollywood Studios: Slinky Dog Dash is the hardest and most helpful FastPass to get - if you don’t have aFastPass, you need to arrive before park opening. Click here for tips to minimize Slinky Dog Dash lines. Toy Story Midway Mania, if you don't have FastPass+ or want to experience this more than once. Thrill seekers should head right over to Rock ' n Roller Coaster & Tower of Terror. If you have a child age 12 or younger who wants to participate in the Jedi Training Academy, you'll need to go within the first hour of day to the stand near the entrance of Indiana Jones Epic Stunt Spectacular to reserve their spot; the child must be present to register. Epcot: Depending on what Tier 1 FastPass you chose, you may need to ride Test Track or Frozen Ever After as soon as the park opens if you don't have FastPass+. Magic Kingdom: If you arrive before park opening, go as far forward as possible to be in the first wave of riders to ride Seven Dwarfs Mine Train. If you aren’t in the first wave, ride later and head over to Space Mountain; or you can head over to Frontierland to ride Splash Mountain and Big Thunder Mountain. Families with small children will want to start with Peter Pan, Winnie the Pooh, and the Under the Sea - Voyage of the Little Mermaid, followed by Dumbo, Barnstormer, Mad Tea Party, the Carousel, and "it's a small world" for a great Fantasyland morning with the least line time. Click here for more Toy Story Land Information. During peak travel times, try to eat lunch around 11:00AM and dinner around 4:00 - 4:30PM; you'll enjoy shorter lines at the counter and have an easier time finding a table. Special Note for Be Our Guest restaurant in the Magic Kingdom: This is a new "Beauty and the Beast" themed restaurant in the Fantasyland area of Magic Kingdom has been incredibly popular since it opened. This restaurant is a "table service" location at dinner and a"quick-service" location for lunch and breakfast location. Because the lunch lines were so long, it is the only quick-service location where advance reservations accepted so get a reservation if this location is a big priority. If you have a reservation, you can pre-order your breakfast and lunch through your "My Disney Experience" account and we strongly recommend this; it is a huge time saver. Learn more about pre-ordering at Be Our Guest. Mobile Ordering is another great time saver at the Disney World quick-service restaurants. You need to set up a MyDisneyExperience account prior to your trip and download the app to your smart phone but then you'll be able to order meals at many Disney World quick-service restaurants and pay for them through the app. Once you get to the restaurant, you go back into the app and click the "I'm Here; Prepare My Order" button. The app will let you know when your food is ready to be picked up at the designated "Mobile Ordering Pick-Up" location. Mobile ordering is available when you pay using the credit/debit card linked to your MyDisneyExperience account or with a Disney Dining Plan but is not an option for cash payments. The Magic Kingdom is typically really crowded on the 4th of July. The great news is that the Magic Kingdom usually presents their Independence Day fireworks display on July 3rd too so there is no good reason to battle the holiday crowds.